The Lumley Ghost: A most unusual ghost story that caused great debate in A Facebook group, ‘Afterlife Answers’ also expounded the boundaries of the ghost debate. The topic of ghosts and hauntings, which led to some fascinating debates on what exactly a ‘ghost’ was brought with it great controversy of opinion, What is a ghost? Could it be an Earth-bound entity, forever doomed to wander a specific location? Might a ghost be simply an ‘angelic spirit’ of some kind, or perhaps there for one particular purpose? One of the greatest joys of any paranormal research is discovering historical tales that appear to defy rational explanation – particularly, (as with the infamous ‘Lady in Black’ Cheltenham ghost from a previous P.D.N. article) – when there are multiple attested accounts and a mass of information to back the stories up. This got my researcher’s head on, as I was aware of several types of ghost story whereby the spirit seemed to be returning for one express purpose. While I found several ghostly forms that fitted this particular scenario, one story in particular remained lodged in my memory. 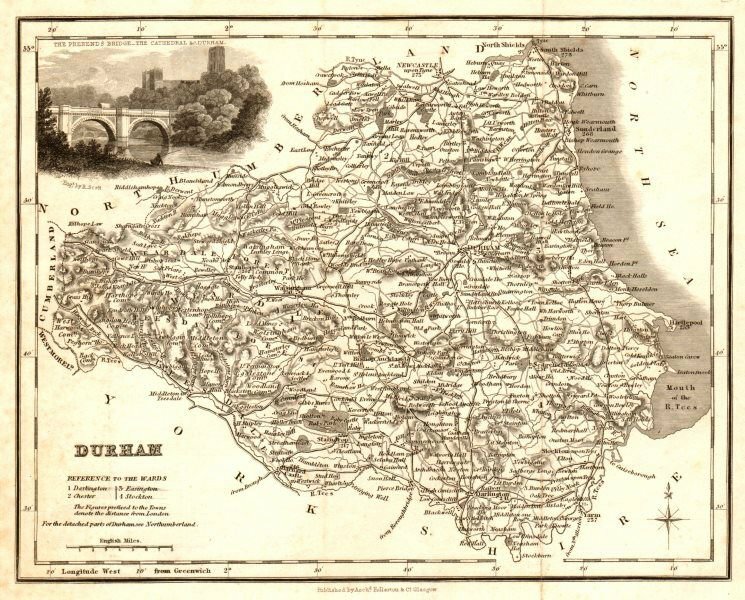 A Map of the County of Durham, North-East England, Printed in 1833. So, let’s go back to the year, 1630 in the English county of Durham (towards the top right bit of England) and a village known as Lumley. Living here at this time was a man called John Walker. John was a widower and – much to the consternation of the local villagers – now shared his home with a much-younger, female relative called Anne Walker. Naturally, rumors circulated widely, in the lanes and inns of Lumley, concerning the true nature of their relationship and, for whatever personal reasons, it somehow became common knowledge that Anne had fallen pregnant. At this point, Mark Sharp – a miner originally from Lancashire (towards the top left bit of England) – enters the scene. A friend and colleague of Lumley’s chief source of gossip, John Walker, Mr. Sharp appears to have had earned a reputation for the more violent and criminal pathways of life. The pregnant Anne Walker was dispatched to an Aunt’s house, while no doubt the village resounded with assorted gossip, concerning her plight and future; no doubt along with the future course of her eternal soul . At some point, Mark Sharp visited Anne’s aunt and persuaded her that – on John Walker’s orders – a family home had been located for Anne, well out of the district and away from nosey villagers. As John was a Yeoman (a gentleman owning a considerable size of land, making him powerful locally and someone to be respected) and considered to be of good standing (aside from the many gossiping tongues within Lumley village), the Aunt helped Anne to pack and soon Mark and Anne had left the area. Anne was never to be seen alive again. 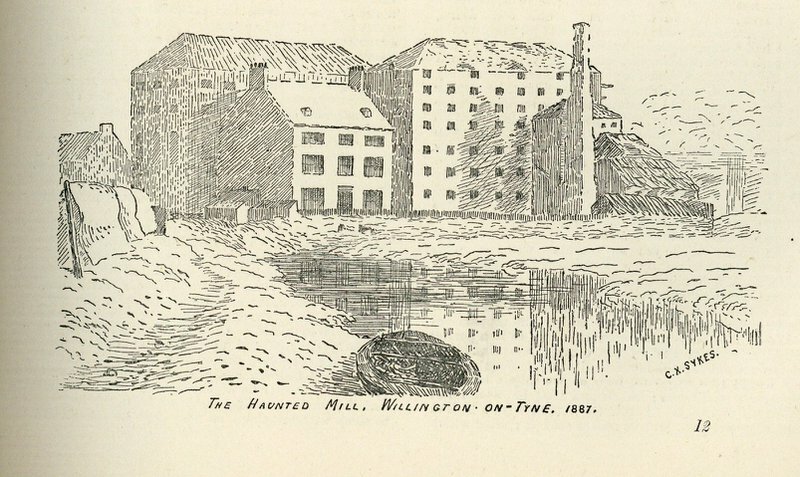 An 1887 drawing of Willington Mill, County Durham. Unsure about what to do next – and not wishing to upset John Walker, a man of power and authority, John Grime decided to keep things to himself. Accordingly, this did not go down very well with the restless spirit of Anne. Now suitable terrified, John Grime went straight to the authorities and told his tale. In checking out his story, poor Anne’s body was discovered precisely where the spirit had mentioned, along with some bloodied clothing belonging to John Walker. Walker and Sharp were duly arrested and, despite their stout refusal to admit to murder, they were soon on trial. When found guilty, both men still declined to admit any form of guilt, right up to the point where they were quickly executed via a hangman’s noose. On one hand, this appears to be a convincing case of a vengeful spirit returning from death to condemn her killers and this certainly wouldn’t be the first of its type. However, could there be other logical reasons; perhaps more Earthly? Might this be a case of using the paranormal to cover up a heinous murder? John Grimes was able to tell the authorities exactly where Anne’s body was located. Could this be because he himself had committed the murder and used a supernatural tale as the perfect alibi? It has to be taken in account that this is the 1630’s – tales of witchcraft and the occult were prominent. It must also be taken into account that this specific area of Durham was full of ghostly stories, passed down from generation to generation. It is estimated that rumors of the land being haunted, or curses, dated back into the 1400’s. Also, over the centuries - and much like ‘Chinese Whispers’ - some differences have appeared in the story. Perhaps misheard, or mispronounced words, excitingly spoken over the course of nearly 400 years, but nonetheless, it has to be understood that these variations exist, such as the exact surname of Anne and the year that these alleged events are supposed to have occurred. Indeed, several rumors circulated at the time about events within the courtroom, including two specific tales that Anne’s ghost had appeared directly before the judge himself. Another witness claimed to have seen the spirit of a child standing on the shoulders of John Walker in court. While some doubt may lay upon the head of john Grimes, it's also relevant to know that there were more claims of paranormal activity at Willington Mill. In his 1842 book, 'Authentic Account of a Visit to the Haunted House at Willington, Near Newcastle Upon Tyne' Moses Aaron Richardson (1793 - 1871) included multiple examples of ghostly activity within the mill, including several apparitions and horrific noises. Indeed, several rumors circulated at the time about events within the courtroom, including two specific tales that Anne’s ghost had appeared directly before the judge himself. Another witness claimed to have seen the spirit of a child standing on the shoulders of John Walker in court. Despite many separate accounts of Anne’s grim demise, there is still plenty of room for speculation. The only certainty is that the story itself would easily adorn the pages of any paranormal fiction novel.